15+ Kitchen Lighting Ideas for Any Styles, Newest !! kitchen lighting ideas – Kitchen is such a hive of activity preparing meals, reading recipe books, having breakfast, and enjoying morning coffee. As a place in which you spend most of your time, slaving over a hot stove and having meals, creating a relaxed ambiance is a must. Therefore, picking the right kitchen lighting ideas is necessary. Working on the kitchen lightings is a convenient and affordable way to spruce your kitchen, no need to spend much money on renovation. Either having the lighting done or doing it by yourself by using your DIY skills, kitchen-lighting project will not burn a hole in your pocket. If you haven’t made up your mind yet, please feel free to pick one of the following kitchen lighting ideas that suits your kitchen well. More and more homeowners have taken lightings installation to the next level. Lightings used to be installed to help them work efficiently. But, today, kitchen lightings are not only about shedding the light on the workplace, but also embellishing the kitchen, enhancing particular styles. To create a spectacular look, you had better choose the lightings meticulously. Make sure that they fit the style of your kitchen just like this French country kitchen. 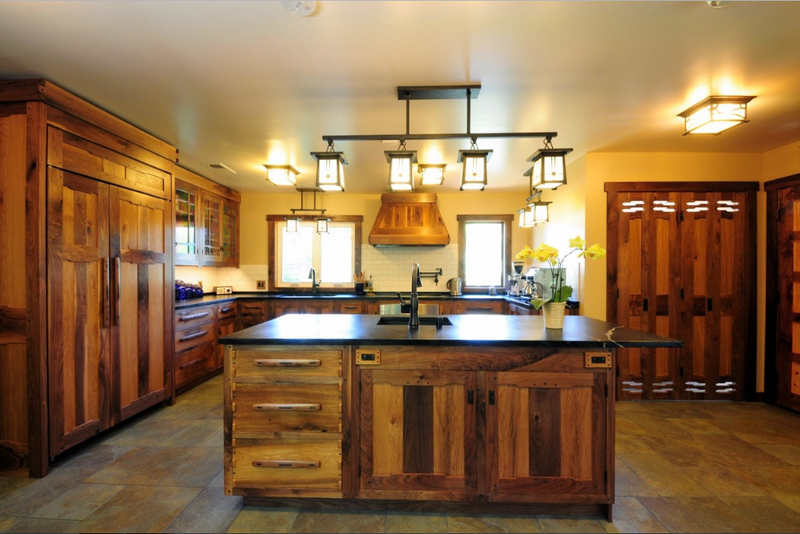 French country kitchens are about well-worn and classic furniture to enhance elegant look. These rectangular lightings really do a great job to shed the lights over the entire kitchen as well as accentuating it. Some lightings are attached right on the ceiling while some others are attached on black matte plate. 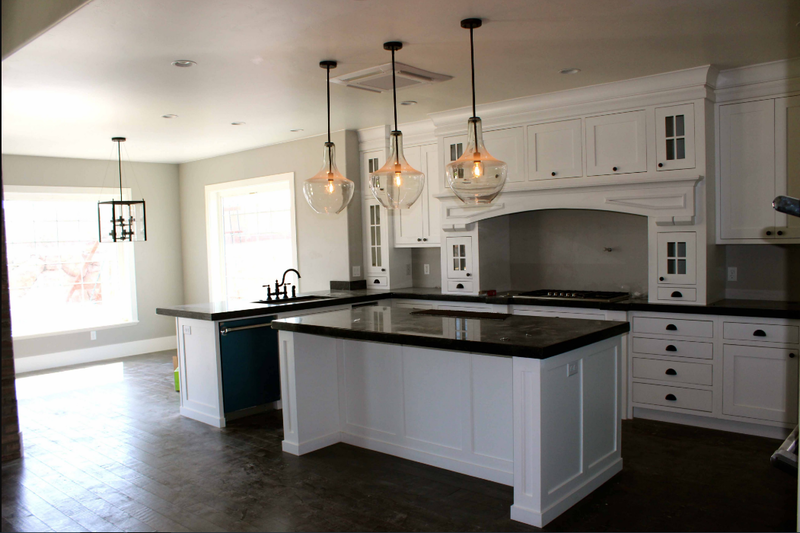 The arrangement of the lightings focuses on the busiest spots such as the stoves, kitchen sink, and countertops. Good lightings mean they do not only provide sufficient lightings that enable you to work in the kitchen well, but also interact with the other furniture and colors. 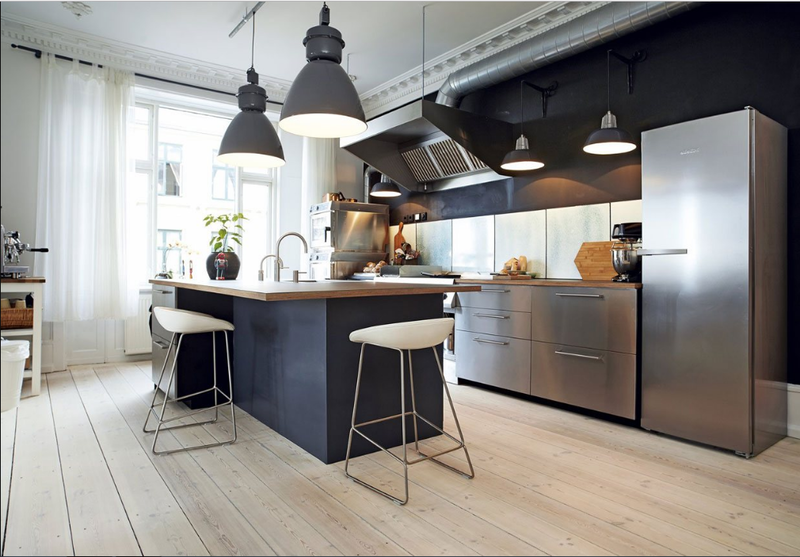 Fortunately, this kitchen uses black and white colors the most versatile colors ever. Any lighting styles can fit them well including these pendant lightings. The incandescent lamps shine dimly insideglass jars. They are hung right above the countertop, giving a romantic touch to the kitchen. A pendant chandelier is hung over the entrance to shed the lights over every step. The lightings give a romantic touch to the kitchen. The dim lightings are better than glaring ones. They merely focuses on the countertop and aesthetic rather than practicality which make insufficient lightings in the other busy spots. You will not be able to see the stove and everything on it clearly because you block the lights. Modern kitchen adores simplicity rather than sophisticated look because it believes that less is more. Therefore, you will not find wrought iron that has been fastidiously carved to hold the lamp. But it does not mean that modern kitchens do not fancy installing lightings to improve its look. Modern kitchens tend to be bright with their bold colors and lightings just like this kitchen. Recessed lights are installed on the ceiling and spread throughout it, giving sufficient, even excess light throughout the kitchen. It enables you to work inthe kitchen efficiently. Good teamwork is not only found in your work place with your partners. In fact, good teamwork is also needed in your kitchen. However, I am not talking about the teamwork between people. 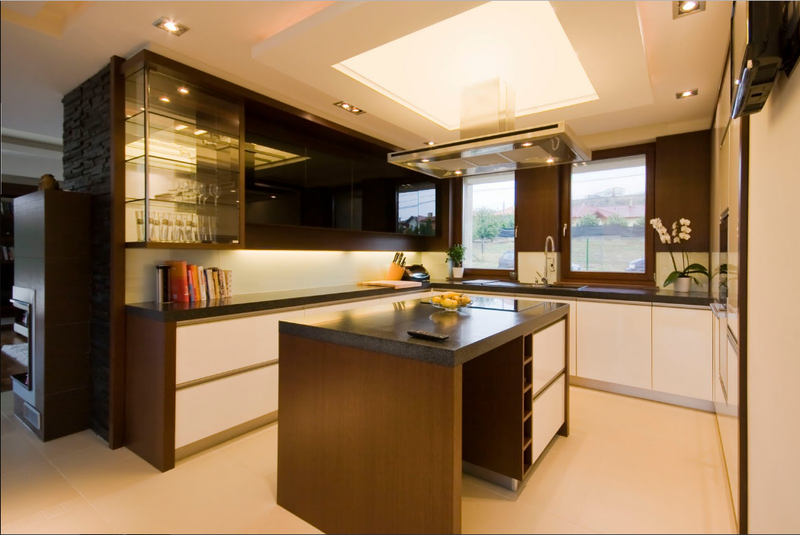 It is the interaction of your kitchen interior design with the lightings forming excellent teamwork. This kitchen looks elegant with glossy natural stone countertops. 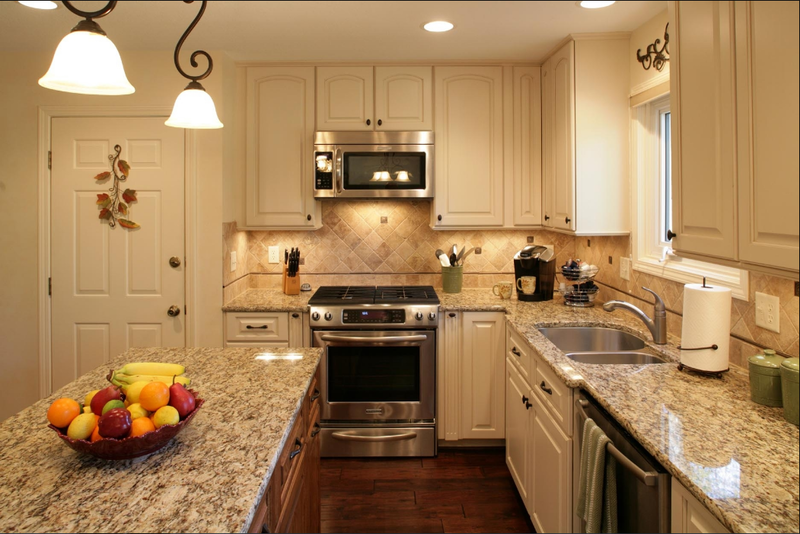 The backsplash is also made of natural stone tiles that showstheir soft beige color. Elegant kitchen needs elegant lightings that can enhance its lush look. The lightings over the countertop look like dazzling flowers hung upsidedown with curved metals. They give soothing light throughout the kitchen. Some recessed lights are added to provide adequate lightings in the kitchen especially over the kitchen sink and stoves. Sleek design, monochromatic colors, and edgy fixtures are the significant features of modern kitchens ── elegance in simplicity. To enhance the idwa if modern designs, simple lightings are more preferable than seemingly lavish ones that entail sophisticated details. This kitchen uses recessed LED lightings to complement the simple design of it. The lightings are arranged in three rows, creating sufficient lights to the whole parts of the kitchen. LED lightings are also installed beneath the kitchen cabinets to shed extra lights over the countertop. To kick the kitchen up a notch, blue LED lightings are installed under the edges of the countertop, shedding beautiful blue lights over the wooden floors. Another inspiring kitchen for your modern interior design. This kitchen is full of lightings that are installed in the ceilings and beneath the kitchen cabinet. 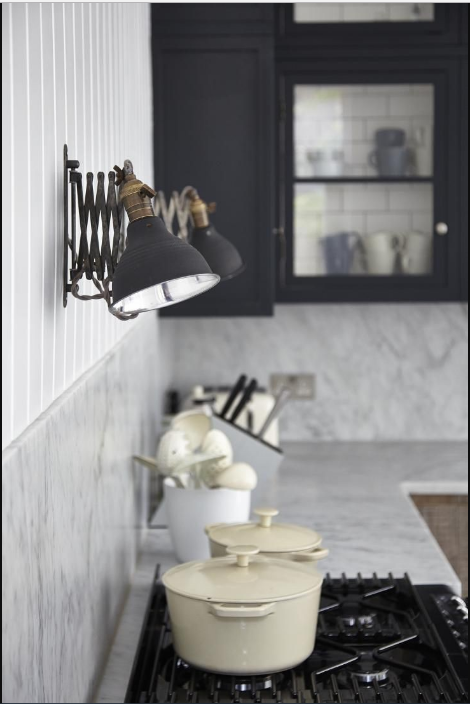 Recessed lightings have never failed to be a practical adornments in every modern kitchen. 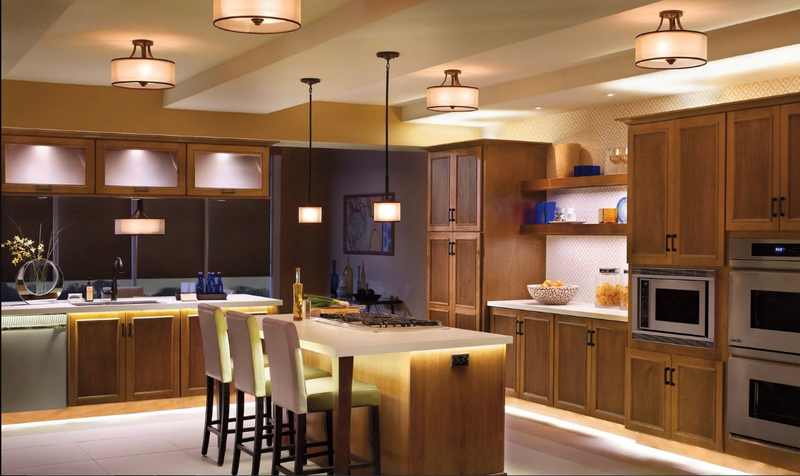 The recessed lightings and the brown shades of the kitchen team up to create calming ambiance. The most conspicuous lighting fixture is the one floating over the brown countertop. It is an astronomical LED lightings that shed soft light right on the countertop and throughout the kitchen. Despite having a lot of lightings, this kitchen gets adequate lightings to work on the meal preparations. The lightings are just perfect ── not too dim, not too bright. Modern kitchen does not always use recessed LED lightings to brighten up the kitchen. Even pendant lightings can enhance the classy style of the kitchen. 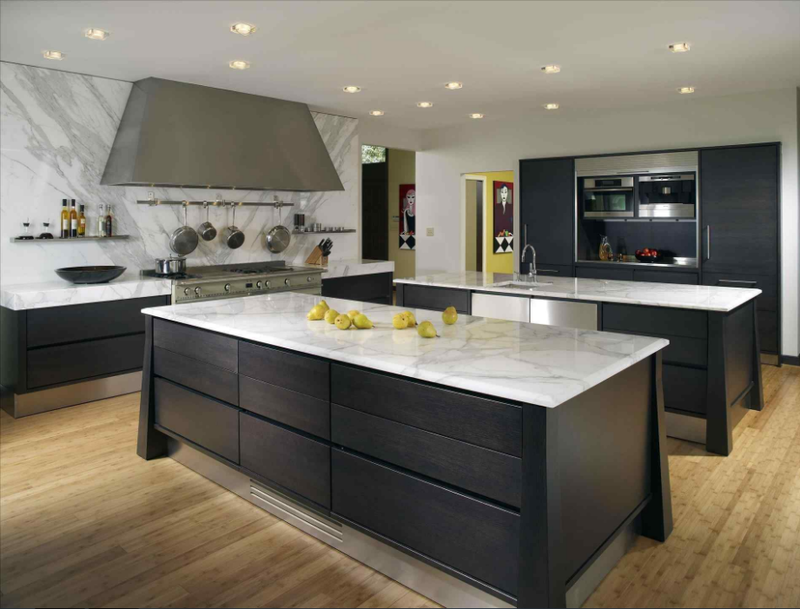 Black matte finish of the walls and thesides of countertopprovide the bold and masculine look to the kitchen. To accentuate the boldness of it, some black matte pendant lightings are added. The blackmatte provides a little bit of classic vintage style to the kitchen. The arrangement focuses on the nature of lightings── to shed some lights. Therefore, those pendants are hung above the busiest workplaces such as the kitchen sink and stoves. Celebrating your special day does not mean going a fancy restaurant and having feast which, eventually, can make you broke. 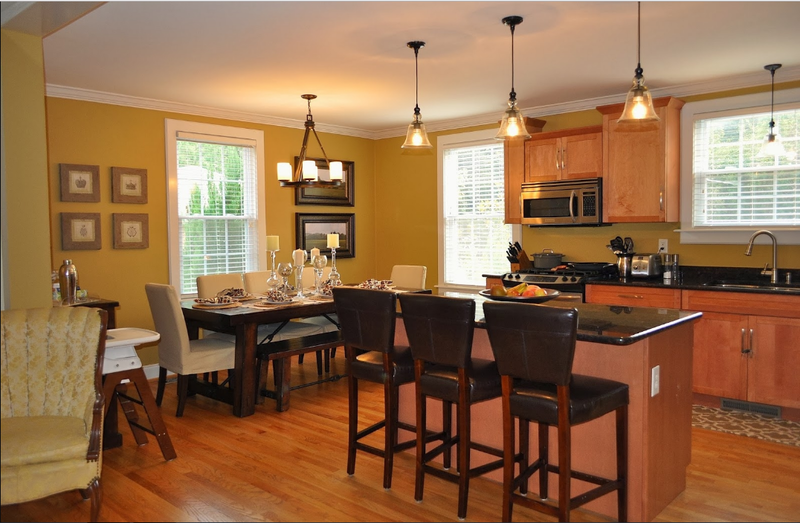 A simple yet impressive dinner can be done at home with the assistance of kitchen lightings. This classic French kitchen applies romantic ambiance through the furniture and some accessories such as the photos of landscapes. To enliven the romantic feelings, some pendants can do a great job. The incandescent lamps shine dimly through the glass, making them look more beautiful. Some LED lamps looking like candles are floating above the dining table. For additional lightings, you can put some candles with various heights. Besides, candlelight dinner has always done a great job when it comes to creating romantic ambiance. Rectangular pendant lightings are always great with eclectic styles. 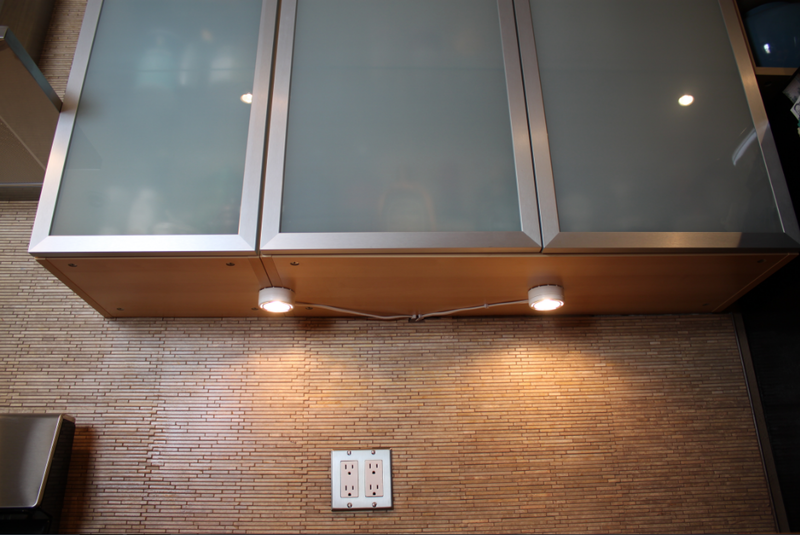 In addition to pendant lightings, some recessed LED lightings are installed in some spots. 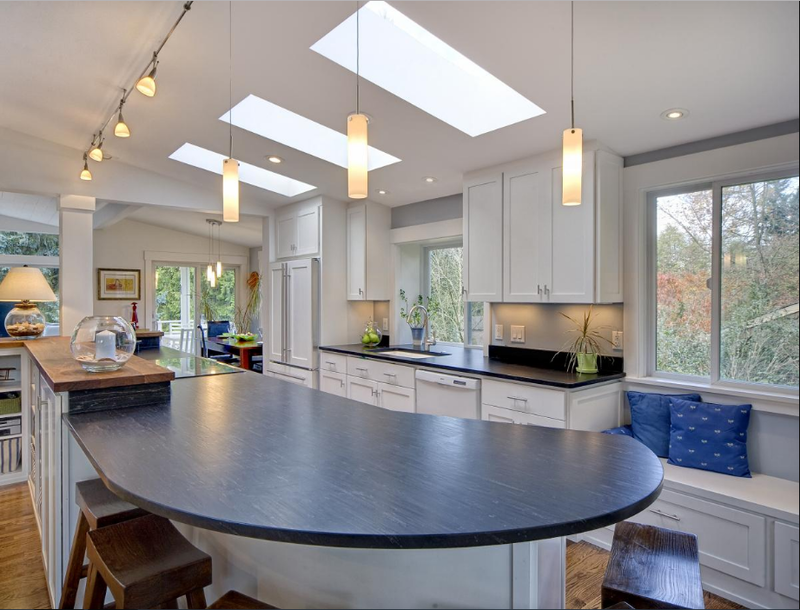 Although this kitchen uses many lightings, it is not overwhelmed by the glare. In fact, some spaces remain dark. But not completely dark. They are just dim. If you want to create a romantic feel throughout the kitchen, the rectangular pendant lightings will be enough. But if you want to brighten your kitchen up a bit, LED under kitchen cabinet lightings are the best. 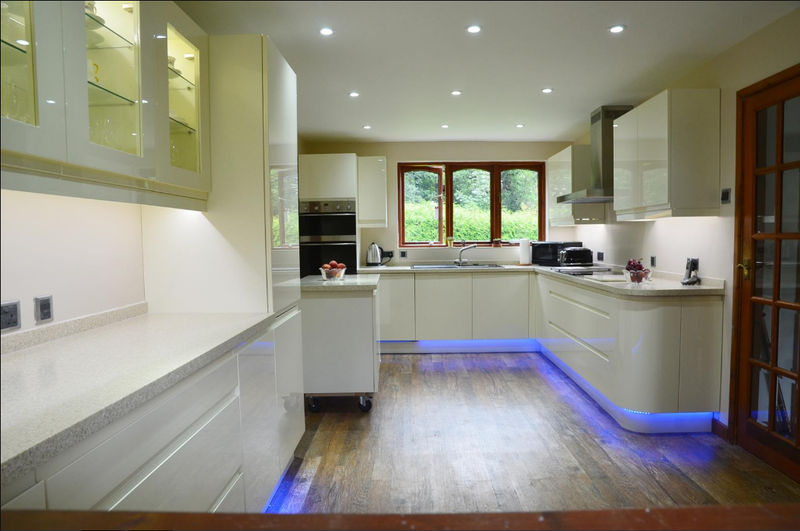 Those LED lightings shed bright light to the lower parts of the kitchen, balancing the dim side occuring in the upper parts. They are like yin and yangthat complement one another. Provide a romantic touch to your kitchen. Too many lightings can affect the electric bill. Installing lightings in the kitchen cabinet can be a good idea because it enables you to see what is inside the cabinet without opening its door. Besides, it gives blurred effects that make the cabinet looks lavish and exquisite. To perfect the appearance of the cabinet, LED lightings are installed under the cabinet, shedding soothing light over the countertop and the beige tiles backsplash which make them look like gold. 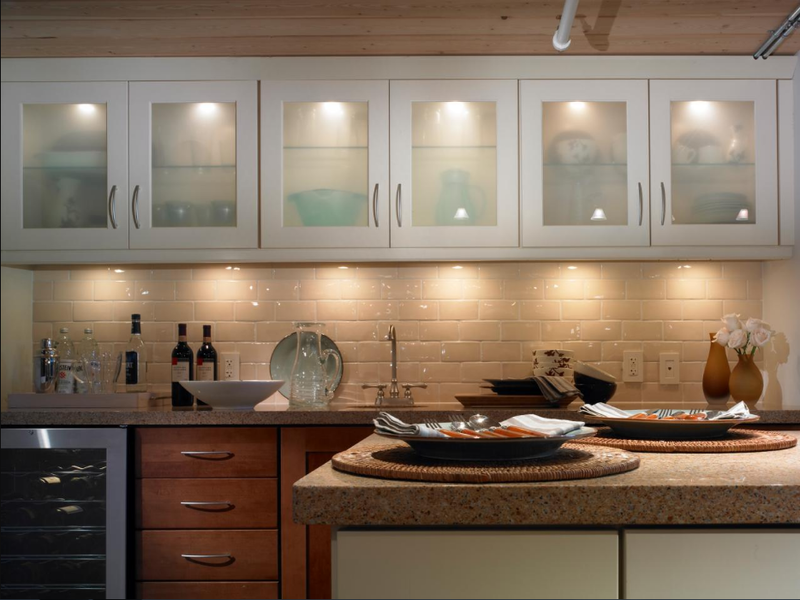 Installing under cabinet lightings can help you improve the appearance of your kitchen. The lightings give an elegant look when shedding over the backsplash. Besides, under cabinet lightings servea lot of benefits. Remove the shadows on the countertop resulting from the lightings on the ceiling that shed over the top of the cabinets rather than the countertop. By removing the shadow, you will be able to prepare the meals on the countertop more efficiently. Easy to install. You do not need a ladder to install the lightings because you can reach them easily. Some materials such as LED fixture are costly. If you don’t want to renovate your kitchen, there will always be a solution. You can use track lightings that enable you to add as many lightings as possible. The small lightings that were installed upside down are not attached directly to the ceiling, but on a long copper pole that can accomadate more lightings. The combination of lightings, the countertop, and the copper pole make the kitchen look more fantastic. The hanging pendant lamps are elegant with the tubes that reduce the glare. Vintage style is detected in this kitchen. The use of matte finish is one of the significant features of vintage kitchen. Everything has to look classic as this style was found around 70s. One of the classic look is the lightings. Two lamps are mounted against the beadboards. Both of the lamps have black matte finish with distinctive holders that are usually found in industrial area. The lamps are installed above the stove because they will help you to take a look at what is inside the pot easily. Now, slaving over a hot stove is not frustrating activity anymore. 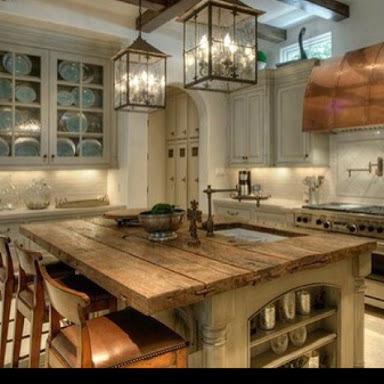 Steampunk kitchen is all about rustic and industrial look. Therefore, the furniture and the fixtures are usually made of roughly finished woods, leather chairs, and copper finish. And don’t forget the lightings. They have to be classic or, at least, make them look classic by distressed process. These pendants look like rustic glass cages with well-worn wires. The incandescent lamps are meticulously designed to imitate candles. Thus, the lightings look like candles that are sparkling inside the glass cages. For a better sight, LED under cabinet lightings can be added. Impress your friends with this disco balls lighting idea. Well, they are not the real disco balls, actually.However, they are really unique and conspicuous. They will grab your guests’ attention when they enter the kichen. 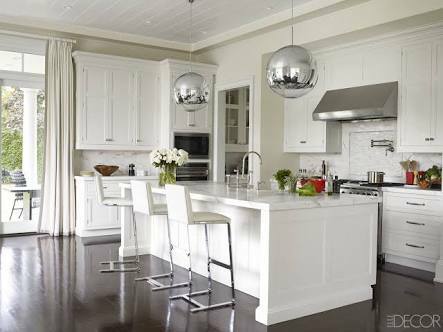 The lightings are perfectly hung above the kitchen sink as well as dining table to shed some lights on them so that you can get a better vision when having dinner or washing the dishes.Silver color look dazzling among white cabinets and walls, making the kitchen a great place to have a fun meal. Old, but not old-fashioned. That is what I call incandescent lamps. They might not be as bright as LED lightings, but the classic of these incandescent lamps are great adornments to any romantic ambiance. 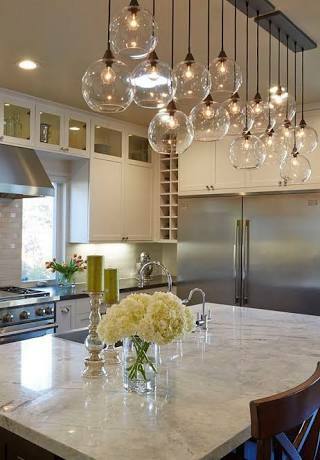 This kitchen has taken incandescent lamps to the next level by adding roundedglass jars that look like flying bubbles. The dim lights of the incandescent lamps are clearly seen through the glass jars. 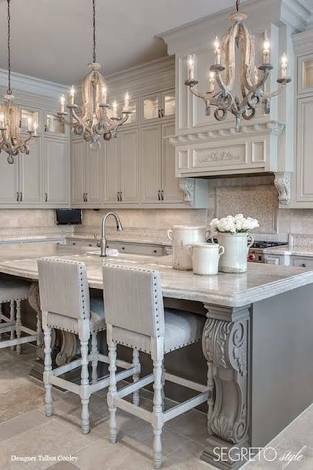 Victorian kitchen is always about extravagant look that is represented by thethoroughly carved furnitureand ornamental accessories. The chandeliers hung above the dining table embody the extravagance and elegance of this kitchen through the curved wires that hold the candles. But they are not the real candles. They are merely incandescent lamps that shine dimly to imitate the light of candles. Those are some great kitchen lighting ideas that you can apply for your kitchen to improve its look. You can pick one of them or combine two or more ideas to get rid of the tedious look of your kitchen. Before picking one of those worth-trying kitchen lighting ideas, you had better make a prior plan so that you will not be lost due to being overwhelmed by the ideas. But, no matter what your choice is you have to remember that the lightings should help you work better, not a mere adornments that make your kitchen look more beautiful.